I have family in for the week, so in lieu of a page, I've posted a special to tide you over. New page next week if all goes according to plan *knock on wood*. James Hartwell is presumably the last Named One, unless the entire race has stolen themselves away in a world long hidden and forgotten. His race is now rapidly becoming a thing of legend, and his only kin become other creatures and races long forgotten by most of the Spiral. Here, he is asleep with unicorns, a species left to myth - and glad of it. I adore The Last Unicorn in all of the tellings, and I'm sure it shows ... One of my favorite book openings of all time. 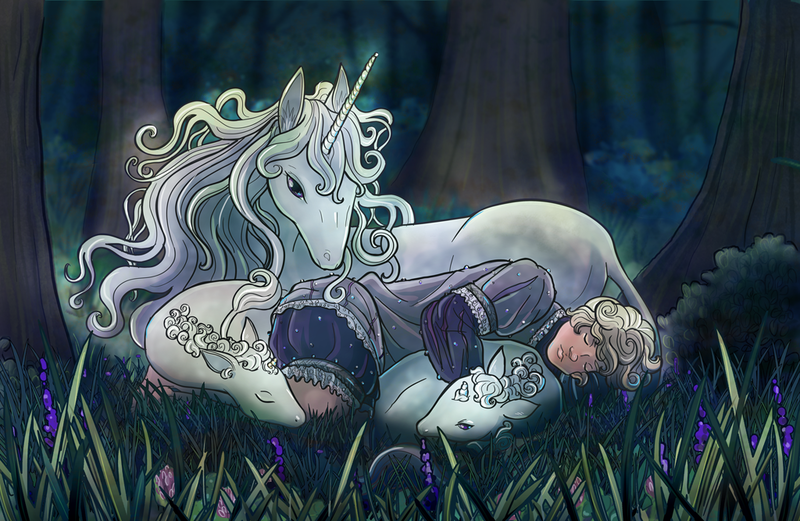 "A unicorn lived in a lilac wood, and she lived all alone."